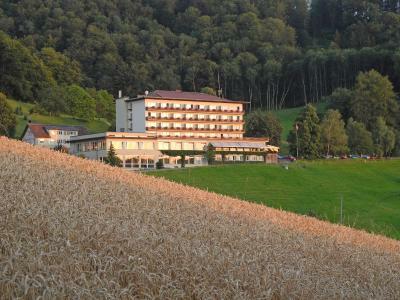 Lock in a great price for Hotel Bad Ramsach – rated 8.2 by recent guests! Lovely surroundings. good breakfast.No time to use the facilities. Spa =1 sauna et 1 hamam. Pas très grand. 1 piscine . Dass wir an der Bahnstation Rümlingen abgeholt wurden, nachdem wir den Bus verpasst hatten. Jederzeit kostenlos Mineralwasser, Tee und Obst in der Lobby erhältlich. Wassergymnastik (kostenlos) Kräuterstempelmassage mit warmen Öl, Buchung war noch für denselben Tag möglich. Abendessen sehr lecker. Wir konnten einen Tag länger bleiben als geplant und auch erst um 13 Uhr auschecken. Was für uns das Wichtigste war: es ist wirklich ruhig hier. 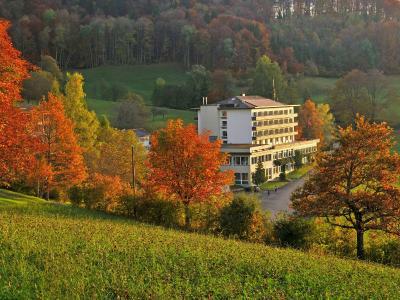 Das Hotel ist idyllisch gelegen. Sehr ruhig und mitten in der Natur. Die Zimmer sind sehr grosszügig und sauber. Wir haben im Restaurant gegessen. Die Speisen war sehr lecker und schön zubereitet. Auch das Frühstück war in Ordnung. 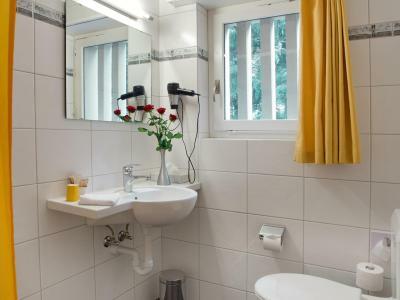 Hotel Bad Ramsach This rating is a reflection of how the property compares to the industry standard when it comes to price, facilities and services available. It's based on a self-evaluation by the property. Use this rating to help choose your stay! 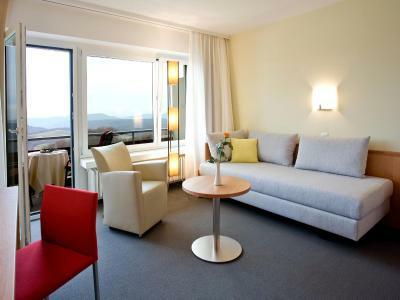 This hotel enjoys an beautiful location in the Jura mountains in the canton of Basel-Landschaft. 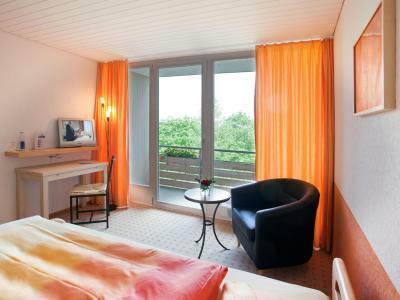 All rooms have balconies and you have free access to its health spa area. 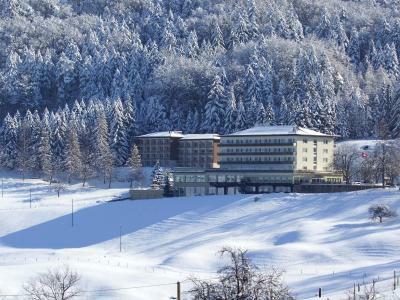 You can make free use of the Wi-fi network in the public areas of the Hotel Bad Ramsach, and borrow bikes and Nordic Walking sticks for free. Panoramic views to the French Vosges Mountains and to the Black Forest in Germany can be enjoyed from the restaurant and from most of the rooms. 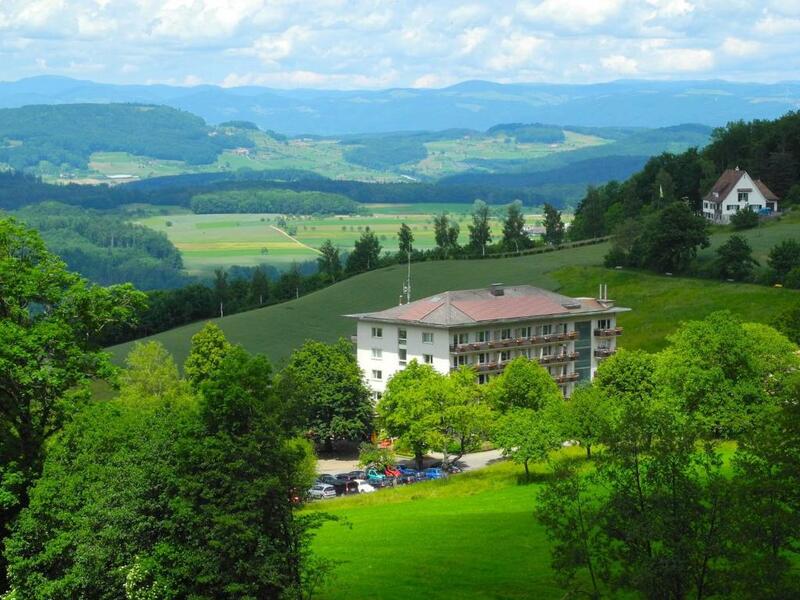 The health spa of the Hotel Bad Ramsach, supplied by a sulfur-calcium source, as well as the sauna, the steam bath and the fitness area are accessible free of charge for all guests. You can also join fitness programs for free. 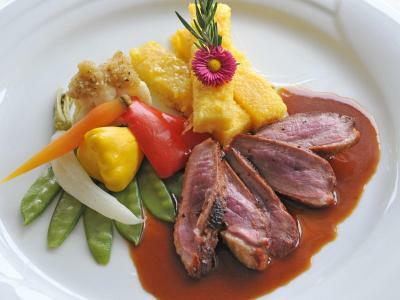 Fine Swiss and international cuisine is served in the restaurant featuring a terrace with panoramic views. You can park your car for free on site or make us of the free shuttle service from and to the Läufelfingen train station. 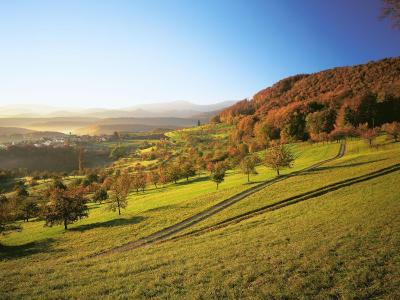 This property also has one of the top-rated locations in Läufelfingen! Guests are happier about it compared to other properties in the area. This property is also rated for the best value in Läufelfingen! Guests are getting more for their money when compared to other properties in this city. 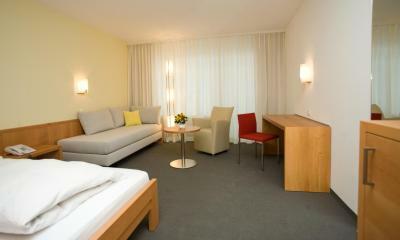 When would you like to stay at Hotel Bad Ramsach? This room comes with a private bathroom, a balcony, a refrigerator and a TV. 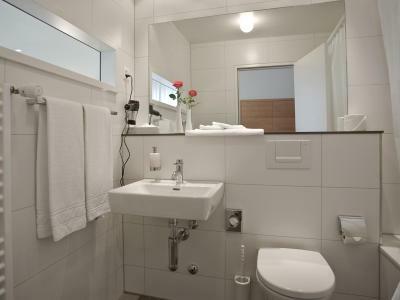 These rooms have been recently renovated and furnished. This room is located in the annex. House Rules Hotel Bad Ramsach takes special requests – add in the next step! Up to three children under 16 years are charged CHF 60 per night when using existing beds. Hotel Bad Ramsach accepts these cards and reserves the right to temporarily hold an amount prior to arrival. If you come by train, please inform the hotel about your arrival time at the Läufelfingen station. You will be picked up free of charge. The Swiss 'Postcard' is accepted as a method of payment. We were disappointed that there wasn't a jacuzzi or steam room. However, there was a sauna and the pool was lovely and warm at 34°. Also shame there wasnt any facilities to make hot drinks in room. 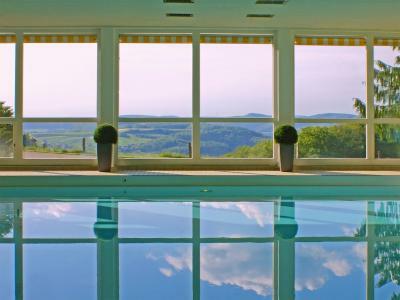 The view was exceptional, definitely opt for a room with a view! Hotel and surrounding environment was very tranquil and relaxing especially hearing the cows with the bells round their neck. 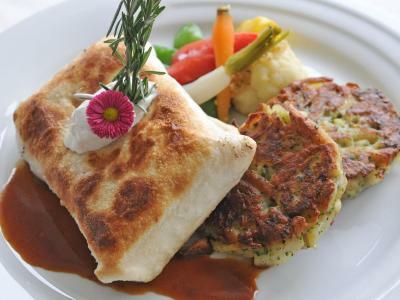 The restaurant and bar has excellent selection and quality. The breakfast was fantastic! The bedroom was great and bed was extra comfy. The staff at reception and in the spa/restaurant were super friendly and helpful. The pool in the spa was lovely and warm. Nice touch in reception with free local spring water, hot drinks and fresh fruit. Lovely local walks. If you fancy fondue go to 'Mr Oliver Greppi' 5 mins drive from hotel. Some outdoor play equipment for children. Goats, ducks and cows roaming fields surrounding hotel. Amazing massage and foot reflexology. Very dog friendly,staff let us have dogs in dining room for breakfast as well as leave them alone in room whilst we went for dinner in local town (just left our phone numbers) and also whilst we used spa. Overall, although it is pricey it is well worth it! room was much too expensive for what it offered. dinner was much too expensive for what if offered.construction. loved the view, the surroundings, the staff.